The moment a mangalsutra is put on a bride, she becomes a married woman. So auspicious ceremony times are often coordinated around the exact time a mangalsutra will be placed around a bride's neck by the groom. In fact, mangalsutra means "auspicious thread," and it is supposed to be worn by a married Indian woman at all times. Photographing the exact moment that the mangalsutra is placed on a bride isn't always easy, as grooms sometimes stand right in front of the bride, and all you can see are their backsides. 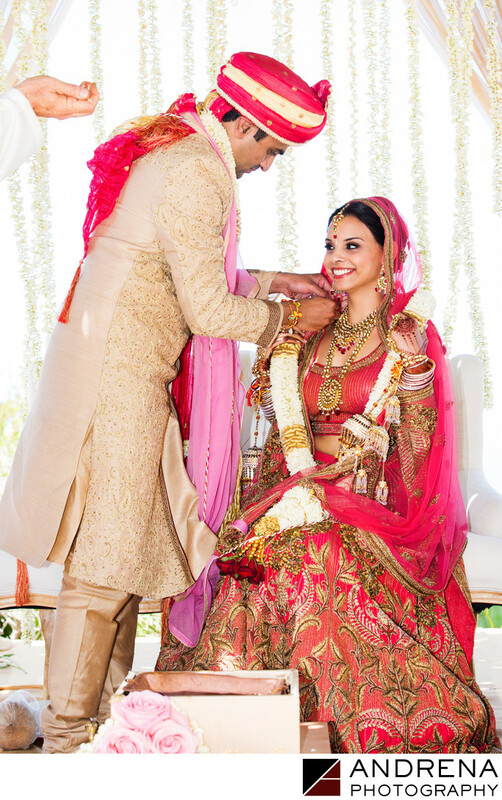 Grooms can also sometimes have trouble getting the mangalsutra onto their bride, usually because of the dupatta and garland getting in the way. When this happens, helpful mommies sometimes jump to help, further blocking our view of the bride. Brides also sometimes get a "serious concentration" face rather than smiling. So this photograph is a great example of how we always hope a mangalsutra photograph should look. Indian wedding photographed at the Ritz-Carlton Laguna Niguel in Dana Point, California.